The Rev. James Anderson, D.D. was probably born in Aberdeen, Scotland, migrating to London sometime before taking over the lease of a Presbyterian chapel in Swallow Street in 1709-10. On September 29, 1721 he was directed by the Grand Lodge of England to "digest the old Gothic Constitutions in a new and better method." The first edition of the Constitutions, including the Charges of a Freemason, was published in 1723, with a second edition in 1738. Source: Encyclopedia of Freemasonry, Albert Mackey. p. 77-8. Portrait from Vol. I - To face page 26. A New Encyclopaedia of Freemasonry (Ars Magna Latomorum) by Arthur Edward Waite. Volume the First. London, William Rider and Son, Limited, 1921. 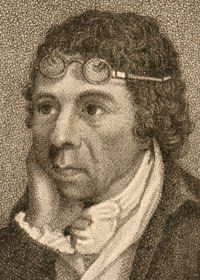 [Fanciful: in fact it is an engraving of the economist, Dr. James Anderson (1739-1808) which appeared in the Gentlemans Magazine of May 1809. AQC vol. lxxvii (1964), p. 17.] The only period portrait of Anderson is found in William Hogarth's "The Mystery of Masonry brought to light by ye Gormagons".